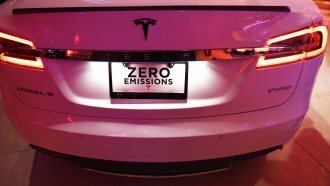 CEO Elon Musk detailed all the specs during an unveiling event Thursday evening. People are pretty excited about Tesla's new electric semitruck. CEO Elon Musk says the semi can accelerate from 0-60 mph in 20 seconds, even at maximum weight. It has four independent motors and is designed to be really aerodynamic. As for charging: Tesla says the truck can travel about 400 miles on a 30-minute charge. And since it doesn't run on diesel, Tesla estimates over $200,000 in fuel savings. The driver will sit in the middle of the cab with screens on each side, and each truck also comes with Tesla's autopilot software to enhance safety. Musk also guarantees the truck won't break down for 1 million miles. Tesla is taking reservations for the new semitrucks for $5,000 per truck, but there are no details yet on the final price for one. Production will start in 2019.